If you’re looking for something festive to do this weekend–well as festive as listening to music from a pair of tragic love stories can be–I’d suggest the Tales from Tchaikovsky program the Chicago Symphony Orchestra is running through the weekend. I saw it last night as part of my Afterworks Masterworks series and was pleasantly surprised to see it was in collaboration with Redmoon Theater. Incidental music from the The Snow Maiden included narration which greatly added to the emotional impact of the music. The second work was Swan Lake, which, beautiful as it is, has become so cliche in my mind that I thought I never needed to hear it again. Wrong. Hearing it live was quite amazing. In addition, Redmoom has created a shadowplay presentation using overhead projectors and paper cutouts to dramatize the story with cinematic touches reminiscent of silent film. Two teams of puppeteers on either side of the stage and behind the orchestra, worked in time with the music. 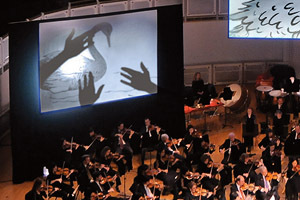 A large screen over the stage used video cameras trained on each projector’s screen to combine the images in real-time. It was a unique and entertaining way to tell the story.